TJ Dillashaw, his ex-Team Alpha Male (TAM) teammate, and former 135-pound title holder makes up the other half, yet you more than likely know this. Having starred opposite one another as coaches on TUF: Redemption earlier this year, a showdown between both men was scrapped on account of Garbrandt’s injury woes. At UFC 217, “No Love” will make the first defense of his title against Dillashaw in what is expected to be one of the greatest bantamweight bouts in recent memory. The bitterness, rivalry and genuine disdain for one another will make this an unmissable bout and likely provide fans with a potential fight of the year candidate. The history between both men is widely known in the MMA community. Dillashaw, having been a close friend and protege of Team Alpa Male patriarch Urijah Faber, jumped sticks with one time TAM coach Duane Ludwig in controversial fashion. Garbrandt, who has spoken out in the past about Dillashaw’s ultra-competitive and bullying nature as a former teammate also claimed to have footage of him knocking out Dillashaw which he had threatened to release on numerous occasions. “Sometimes there’s negativity and there are cancers that are surrounding anything in your life, you’ve got to cut that out,” Garbrandt said. “That’s what we [Team Alpha Male] did. TJ [Dillashaw] left and we cut that out and whoever else followed, we cut the cancer out. Honestly, he was a fierce competitor. He liked to compete. 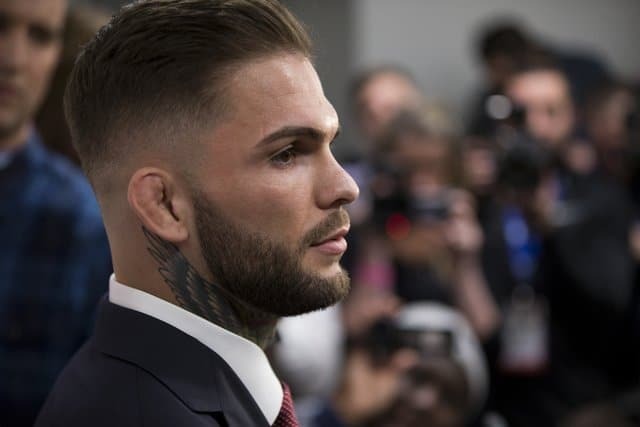 Garbrandt is fiercely loyal to the Team Alpha Male banner and more specifically, Urijah Faber, who he frequently credits as the driving force behind his ascent to the top of the tree in the UFC. Having been unranked at the beginning of 2016, “No Love” shocked Dominick Cruz at UFC 207 in December, beating the all-time great with a ruthless and flamboyant masterclass to take the bantamweight strap. At UFC 217, both men will aim to settle the score in the only way they know how. Should it be a landslide victory for either man, or a closely contested war, there is no doubt that this saga will end at the final bell, however. Why Hendo Can’t Get His Dough?